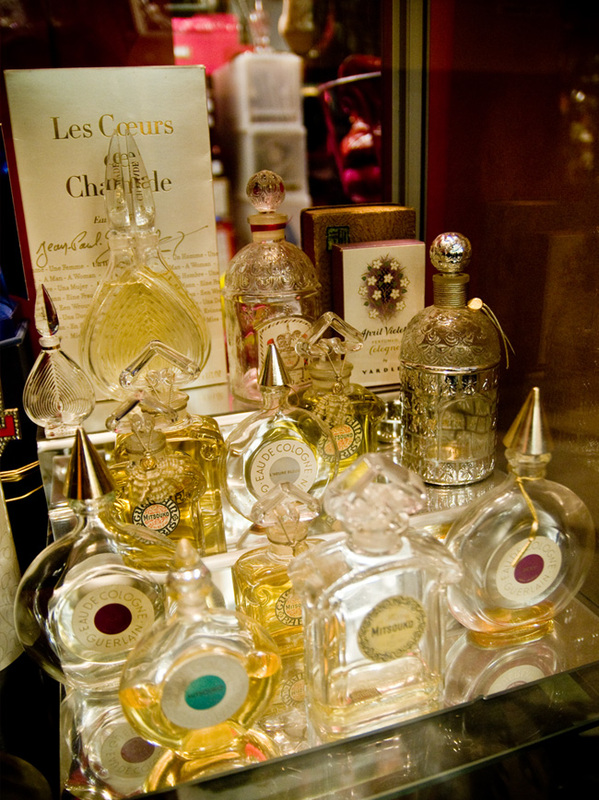 A selection of Guerlain bottles. One of the most enduring French fragrance dynasties. Have you ever bought something just because you liked the look of the bottle? I leave shops clutching bottles of Orangina – bought not because I particularly like the drink (Club Orange tastes much better in my humble opinion) but because I can’t resist the bottle – that glass ball shape. I know, to buy something just because you like the bottle might sound a bit stupid but I believe (make that secretly HOPE) that I’m not alone? For serious bottle collectors (fragrance bottles) the fragrance or ‘juice’ as it’s called, (yes I know, Orangina coincidence there) is largely irrelevant: the value is in the craftsmanship of the bottle. On seeing these bottles at Linda Bee’s stand at Gray’s Antique’s market in London yesterday I wanted to wrap up the lot and give them homes in descending order of height, neatly nestling behind each other on my dressing table like a set of rare Babushka Dolls. 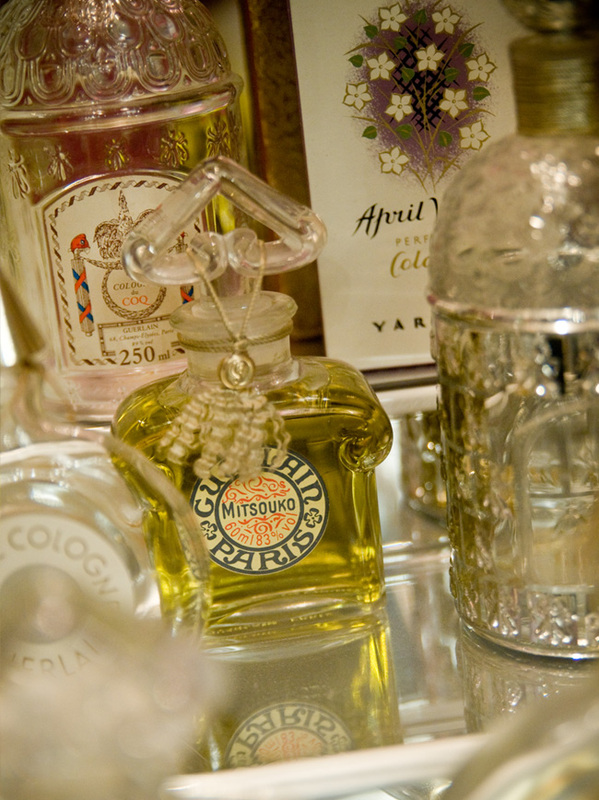 And don’t be mislead by the name, ‘with Chanel No.5, for example, the shape of the bottle (or flacon) has changed so little since its launch that the earliest bottles found in antique stores are a good and affordable place to start collecting. 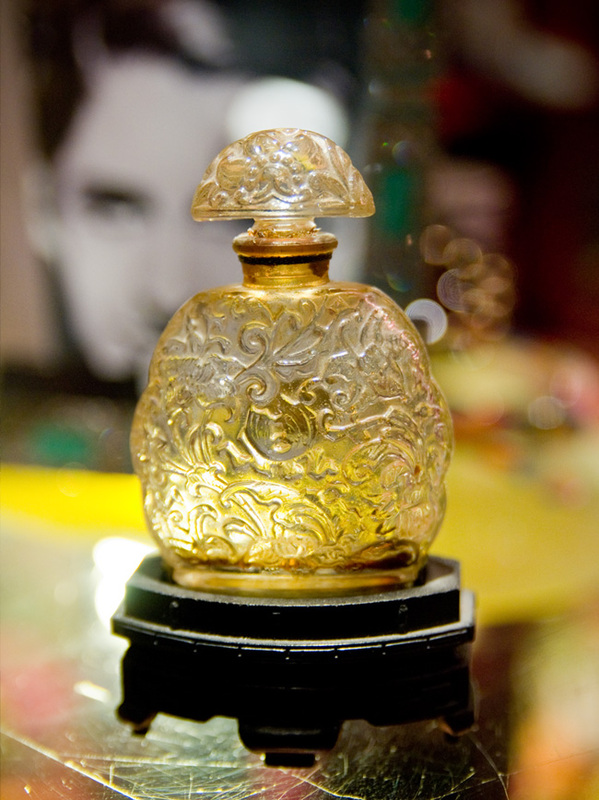 It’s the unsuccessful perfumes, or bottle designs, produced for only a limited time, which are the most expensive. Scarcity equals rarity in the bottle collecting world’. The original Chanel No.5, bottle design legend has it was inspired by the shape of the pharmaceutical toiletry bottles CoCo Chanel’s lover, Arthur “Boy” Capel carried in his leather travelling case. And although the original small delicate round shouldered Chanel No.5 bottle (or flacon) launched in 1919 is rare (was sold only in Chanel boutiques), the design change in 1924 which thickened up the shoulders to allow Chanel to ship it has changed little since. The Chanel No.5, stopper however has seen many changes – the original stopper used in 1919 was a little glass plug until 1924 when it was altered to an octagonal stopper shape. Then in the 1950s through the 70’s the stopper became thicker. Finally in 1986 it was slimmed down again to fit in more with the bottle. So the stopper is a good indication to help you put an age on an antique bottle of Chanel No.5. Guerlain one of France’s leading perfume houses, (see pictures 1 and 2 above) originally had Baccarat, one of France’s most celebrated glass factories produce their bottles. Baccarat set up in the town of Baccarat in 1764 and their famous flacon with its inverted, heart-shaped stopper, was created for Guerlain’s classic fragrance ‘L’Heure Bleue’ in 1912. The same bottle design was also used for the launches of both ‘Fol Arôme’ (1912) and ‘Mitsouko’ (1919). Linda Bee explained that if you’re standing at an antiques fare or flea market in Paris and you have a Guerlain bottle shaped like picture 2. above in your hands ‘check the base of the bottle for an acid-etched identifying mark. Although Guerlain used the same flacons for decades for different Guerlain fragrances, production was given to various glass factories so that Guerlain would not be tied into an exclusive relationship with Baccarat. It won’t always say Baccarat on your Guerlain bottle, but if it does then it’s more collectable’. Also check that the stopper and etchings at the base of your Guerlain bottle to see if they match (hand finished) and look at the glass. Is it thick? It becomes thin in modern Guerlain bottles. Picking out the curvaceous 1930’s Schiaparelli bottle from its cabinet next I was very intrigued by how much it reminded me of the current Jean Paul Gaultier factice bottles which are said to have been inspired by Madonna’s silhouette. Subsequently the Gaultier male bottle throughout the 1990’s I believe was modeled on Gaultier’s own silhouette, a self-portrait of the French matelot (‘sailor’) in his blue and grey sweater that has become Gaultier’s trademark. 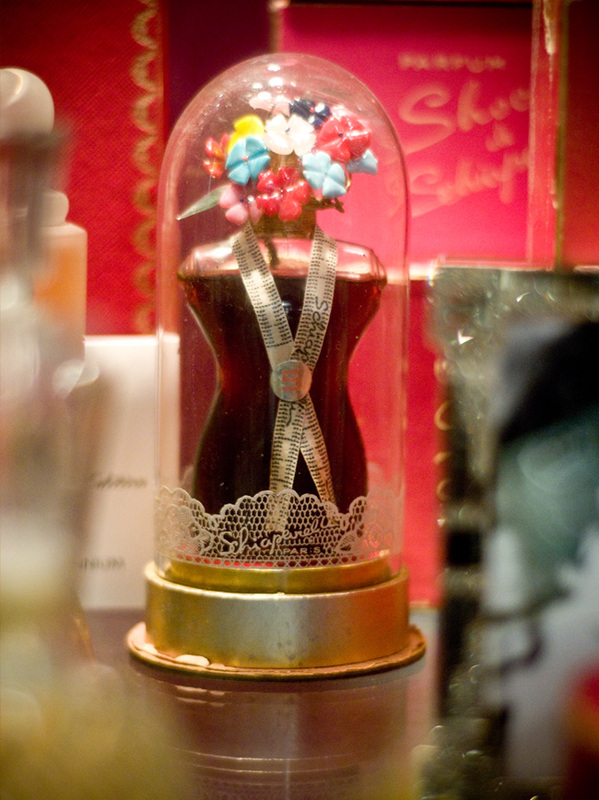 But the story attached to the Schiaparelli bottle is equally as um, fascinating. Italian born couture designer Elsa Schiaparelli was commissioned to design some costumes for American based actress Mae West, who couldn’t due to scheduling problems get to Paris for couture fittings. Instead she sent a plaster statue of herself in the pose of Venus de Milo so that Schiaparelli could make her a dress. Schiaparelli worked with artist Elanor Fini to create a bottle for her ‘Shocking’ fragrance based on the silhouette of the tailor’s dummy of Mae West she had in her studio. Covered with a glass dome, she put a tape measure round the neck of the bottle to allude to this and launched it in 1936. For the fragrance box Schiaparelli created a new colour, Shocking Pink which later became Schiaparelli’s trademark colour. Of course, Christian Dior needs no introduction, especially if you’re a fashion fan but for most of the 1940s, perfume production in Europe was hampered by wartime restrictions (1939 to 1945) and so Christian Dior (1905-57) didn’t introduce his own version of the hourglass silhouette into fashion, until just after World War II in 1947. Emphasising the bust, cinching in the waist and with long, flowing skirts, he launched the ‘Miss Dior’ fragrance to coincide with his idea the same year and named it after his sister. 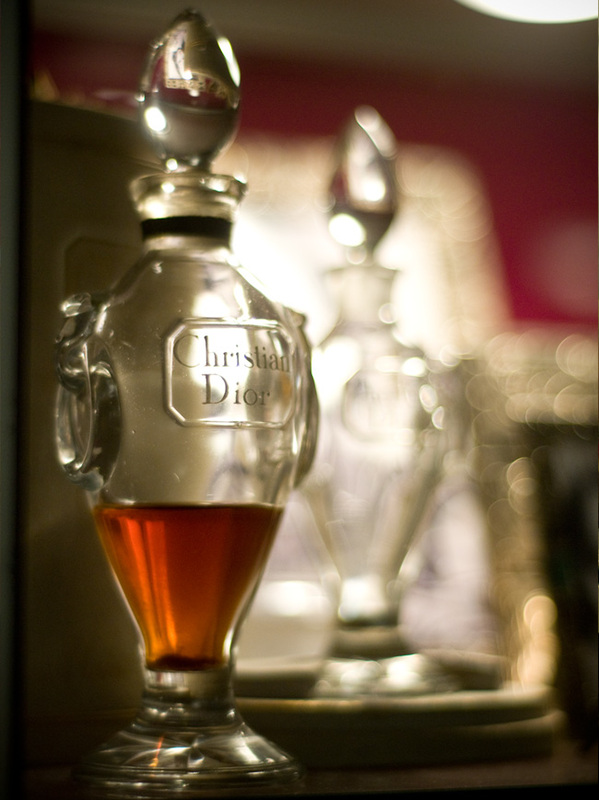 The curvaceous bottle (picture 5) created by Baccarat mirrored Dior’s designs. Likewise Prince Matchabelli (1885-1935) escaped the Russian Revolution and moved to New York where in 1926 he established a fragrance company and in 1927 he patented the firm’s famous crown-shaped bottle, based in his family crest (picture 6). He gave his fragrances names like ‘Katherine the Great’ and ‘Duchess of York’. To finish up… another way to get our hands on a vintage bottle is to opt for 1930’s Czechoslovakian glass bottles which look like Lalique but are much less expensive and have atomizers attached. The only problem here is that antique atomizers can sometimes harden up so thanks to Linda for her diligent check list…. ‘Test an antique atomizer before buying a bottle at a fair, store or auction’ by squeezing the puffy thing. A gust of air should come out. Sometimes fragrance can lodge in the puffy thing and make it go hard and it stops working and won’t spray.’ Linda replaced ‘the atomizer on this bottle with a new atomizer’. I have to say at this point that Linda Bee is really rather brilliant (and knowledgeable). Don’t worry about asking her about her bottles, she doesn’t force you to buy anything…. she just wants EVERYONE to adopt a little antique gem so…..
fortunately and finally, here come the miniatures – known as ‘echantillons’ in France where they were developed as testers and sample bottles in the 1950’s. 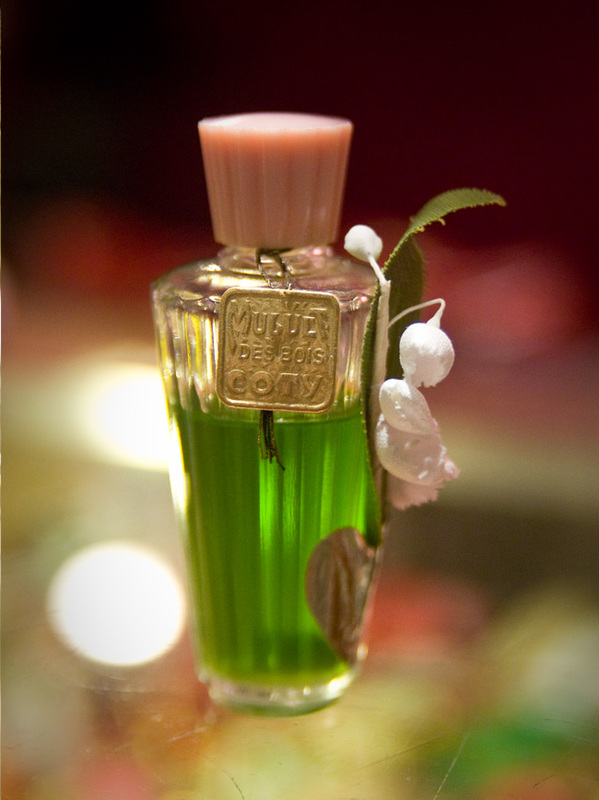 This ‘Muguet’ by Coty miniature (1950’s) is a dinky little example. Tiny, really tiny and so, so beautiful – like sweets… or gems and they’re affordable. Can we justify spending £10? Overall, I think there’s a lot to be said for sensual bottles (and I think in this gargantuan post, I’ve said it ALL). The one thing that these bottles have in common is that they have a beautiful story attached to each which allows me to feel as if I could own something rare and special and pass the story and the bottle on someday. There’s a lot to be said for heritage and it’ s a million miles away from rushed duty free shopping. Oh and P.S. Does the bottle shape matter to you at all when you go fragrance shopping? I’m wondering if it’s only me? Now which one shall I bring home? London, W1K 5AB (Tel: 020 7629 592). Magnifique! 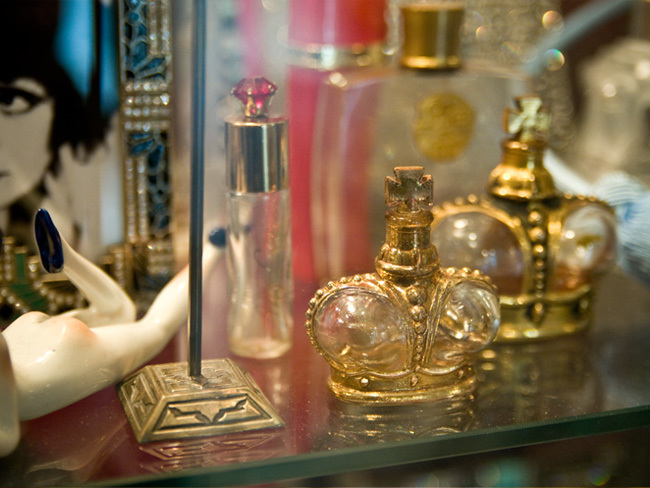 Thank-you for sharing this antique perfume fortress! I love atomizers! I always wonder why they aren’t used in todays perfume manufacturing?! If I was designing a perfume bottle the first requirment I would have is that it HAS to have an atomizer! I love perfume bottles but I also love perfume campaigns. When these perfum bottles were created I think more of an effort was put into the design of the bottle itself where as now-a-days with campaigns being brought into existence I think more effort has been put into the campaign. My favorites are the Vivienne Westwood campaigns. I love the one for the naughty alice perfum. The illustration of the “jessica rabbit” type girl with gorgeous red hair,lips and dress. I love all that red against the baby blue and gold background. and of course I can’t mention a perfume campagne without mentioning the chanel no 5 campaign with Nicole Kidman done a few years ago. Do you remember that one? The mini feature film they did with all the Baz Luhrman crew, even though I’ve seen it a million times, still sends tingles down my spine! I know I say this after all your posts but I really really LOVE this post! (This makes it into the favorites category!) something really special and right before bed-time! I will have sweet dreams tonight! Alien has MEGA staying power!! All of Thierry Mugler fragrances last forever on the skin! PS. Love Love The Goddess Experience, only purchased the Goddess Experience at the weekend and I am hooked! Keep up the good work Gisele! How exquisite! What a lovely post Gisele, thank you. I’ve died and the destination is heaven… I have to say, the bottle shape does appeal to me when looking (or rather, drooling) over the perfume counter. Ah! That must have suited you down to the ground. I have to say, I do love that ad… lovely, free horses galloping on the waves. Your blog had me googling ‘Elsa Schiaparelli’…oh my! “What would I like to be in another life, if that could happen”, and the shocking pink colour is, of course, there throughout. I love the idea of having a dressing table stocked with bottles from travels to here and there, a few lovely bottles to leave to the grandkids. I’m not au fait with collectors bottles, not at all, however your blog has me intrigued! I’m so delighted to have discovered your blog, as I love your books! What gorgeous bottles – I really want to visit Gray’s Antique Market now. I adore the Organgina bottles and never want to throw them out so you’re definitely not alone! No worries. Deciding whether to use pen and paper (which I use daily) or tackle wordpress was the first hurdle; paper always won…it was really as simple as that. I naturally gravitate towards keeping a paper diary and sketchbooks/notebooks. Then just recently I thought. Hmmmm might blog….. it looks like fun. And IT IS! LOVE old bottles. Easily the saddest thing about Greenwich outdoor market closing down was losing the bottle shop. My mum and I used to go ‘bottling’ near a quarry in Shropshire when I was a kid. Lots of fun going for walks and cool digging things up. For her last Christmas present, I gave her a teeny bottle I’d found in a London plague pit. That sounds quite weird written down. This whole article is just divine! When I finished the last paragraph I wanted to start applauding and shouting ‘Bravo!’ As you know, I’m a bit (well no, a lot) of a perfume obsessive, and I have to say, I’m sat here struggling to sum up how much I’m swooning over those gorgeous pictures, and how ‘me’ this piece really is. Honestly, I’ve saved this page to my favourites to read it again. Even with your books my favourite pages are the ones on perfume. Oh I just want to c0me shopping with you to these fabulous places! You’re the only person I know who gets as excited as I do about perfume. Oh and P.S. – I noticed you mentioned Guerlain’s fragrance ‘L’Heure Bleue’; opinions on that? I have to admit, it was not at all what I expected, much sweeter and almost sugary and almondy. The longer I spend time with Guerlain’s Classic fragrances the more I cherish them Adam. The original ‘L’Heure Bleue’ by Guerlain in extrait de parfum is fascinating (but it’s tres expensive on eBay). Guerlain ‘tweaked’ the ‘L’Heure Bleue’ formula a little while ago so now it’s a tiny bit sweeter. You might prefer something greener – Most of my favourite Guerlain fragrances come from the chypre family like ‘Mitsouko’ which was composed in 1919 by Jacques Guerlain and it’s the least changed of all the formulas because it’s one of their most iconic (along with ‘Shalimar’). OK enough with the history lesson here G!…….. I absolutely adore this entry – I collected perfume bottles when I was a little girl and it’s so lovely to read something that’s so familiar yet still interesting. I can remember scouring the markets in France for pretty bottles like this.